The BOND FORCE Pen is a new delivery system containing classic Bond Force adhesive, a 7th-generation, single-component, self-etching, light-cured, fluoride-releasing bonding agent. It is indicated for bonding of light- or dual-cured resin composite to cut/uncut enamel or dentin and fractured porcelain/composite for repair. BOND FORCE Pen features click-button dispensing and has an indicator to monitor the remaining amount of adhesive in the pen. The kit contains a 2 mL BOND FORCE Pen, dispensing well, 25 disposable applicator brushes, and manufacturer’s instructions. BOND FORCE Pen was evaluated by 14 consultants in 380 uses. Instructions and packaging were rated good to excellent. BOND FORCE Pen is simple and easy to use. Several clicks are required to initiate flow of the material. Consultants believed that this dispensing system with its small drops reduces waste of bonding agent. BOND FORCE Pen is an alternative to bottle dispensing. It is not intended for intraoral placement; rather, it is used to dispense the liquid into a well. Rather than dropping freely, the liquid clings to the tip of the pen and has to be touched against the well. 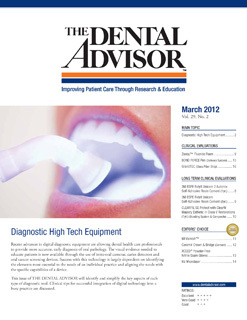 Consultants suggested that intraoral tips be provided for direct placement onto the tooth. The volume indicator window is helpful, allowing you to see the quantity of material remaining. Most consultants liked the viscosity and wettability of the bonding agent on the tooth. Consultants reported that margins were not visible. Consultants rated lack of postoperative sensitivity as very good to excellent. BOND FORCE Pen is a click-button dispenser for BOND FORCE. Thirty-six percent of consultants reported that the BOND FORCE Pen was better than their current dispensing system for bonding agents and 43% reported it was equivalent. Fifty-seven percent would switch to the BOND FORCE Pen and 64% would recommend it. BOND FORCE Pen received a 92% clinical rating. Click several times to dispense material. Keep the pen upright when dispensing.